The library at the Katz Center for Advanced Judaic Studies holds a Sefer Tehilim, or Psalter, printed in Wittenberg Germany in 1576. The text of the book is translated from Hebrew side by side into Ancient Greek and Latin. Books formatted in this fashion were typically meant to help teach Hebrew to Christians. The layout assumed that the reader would be able to read Latin and/or Greek and would be able to infer the meaning of the Hebrew text from these translations. However, it is not the content of the book that is intriguing to me, but rather the cover. 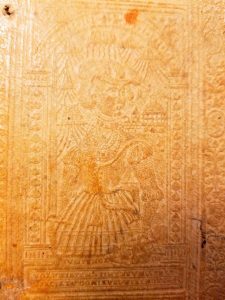 When the book was printed, the original owner, likely a non-Jew, would have selected the binding and any decorative motifs for adornment. The image that they selected for the front cover of this book is of Judith beheading Holofernes from the Book of Judith. This somewhat gory choice is interesting, given that the image has no connection to the contents of the book. So, why was this particular image chosen? Though the Book of Judith was accepted as canonical by the Church and was accepted in the Vulgate, the Catholic Church’s official Latin version of the Bible from the 14th century, it is not the most popular or well known story. 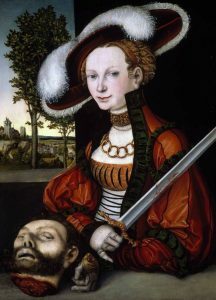 Whether or not the owner was well versed in the story or aware that it had no connection to the text of the Psalms, the image of Judith with her sword and the decapitated head of Holofernes would have likely been familiar to Germans by the 1570s. In the 1530’s , the image of Judith beheading Holofernes became a popular subject for German painters. Judith was typically dressed elegantly in the German fashions of the day, with a hat on her head and a sword in one hand, while the other rests on the head of Holofernes, just as she is depicted on the cover of our book. Though four decades had past between the height of this pictorial fad and the printing of this book, it is not difficult to imagine that the image would have been familiar to the owner of the Psalter. 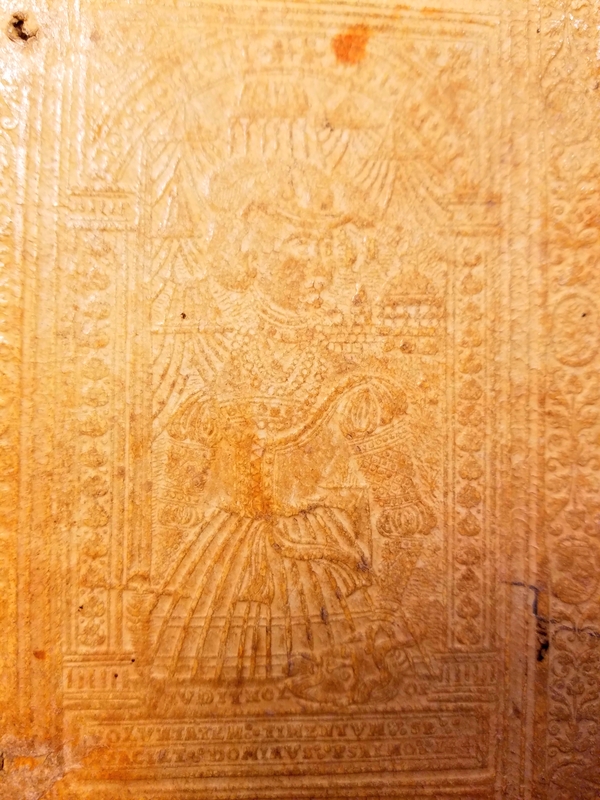 Because of the popularity of this theme, it may well have seemed to be an attractive and trendy choice of image for the cover of the book, even if it didn’t correspond to the materials within.